Blog / Weekly report 09/07. Greetings from the MyWish Team! We are sure that you already know about our integration with EOS blockchain. It’s been a while since we started working on the first EOS Crowdsale Smart Contract. Today we are happy to announce that it’s officially released. At the moment EOS is one of the most popular blockchains out there, but it definitely has the upper hand when it comes to a token sell. Because EOS works without any commission when you invest your cryptocurrency. 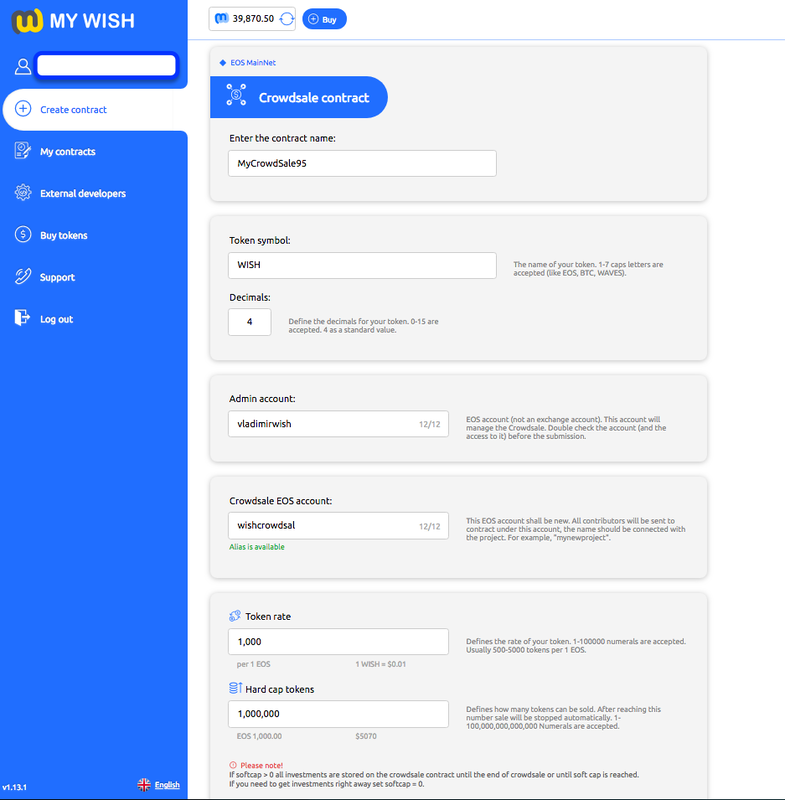 EOS Crowdsale Smart Contract based on MyWish allows any person to create the Contract in a few easy clicks. The Crowdsale Smart Contract is a Smart Contract specially made for ICOs. It was created to develop, distribute, or sell tokens that serve as funds raised through an ICO. Please welcome fully automated EOS Crowdsale contract! 1. NEO rolled out a great update for their blockchain, and because we support NEO blockchain, we also started to update our contracts, it took 3 weeks and now it’s done, you can deploy contracts on NEO using our platform again. 2. EOS Argentina we had a call with EOS Argentina, we discussed the potential opportunity to cooperate, now we also in contact with EOS Nigeria, Canada, New York and Dublin. Stay tuned for the big news, it’s coming very soon. We would like to thank the community for the continuous support.